Madavoorpara, famous for the rock-cut cave temple dedicated to Lord Shiva located here, is situated at Chenkottukonam near Chempazhanthy in Thiruvananthapuram. Rock-cut temples are a rarity in Kerala and Madavoorpara is one among them. Carved out on its steep slope are thirteen steps that lead to this square-shaped temple. The temple is nothing more than a cave carved out on the surface of a bare rock, which has now been protected with iron doors. It is believed that the origin of this temple dates back to the 8th century C.E. and was built by a Buddhist monk some centuries ago. Some believe that the temple was built by Jains. Rock cut temples were one of the main styles of Kerala architecture during the ancient period. A vattezhuthu, an ancient Malayalam script, inscription on the pillar is what’s left of the history that this rock once held. 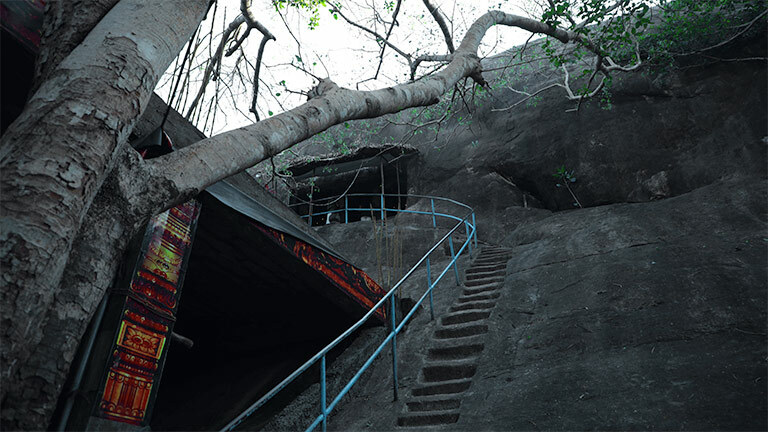 Madovoorpara rock cut was owned by the Chenkottukonam Ashram before being taken over by the State Archaeology Department in 1960 as a protected monument. Today, besides the cave temple, Madavoorpara is being developed to become a perfect recreational spot. The place is attracting crowds for a climb to the hill top and a leisurely walk through the bamboo bridge which leads to the top of the rock. There is also a children's park built at the base of this rock and a few huts to spend some quality time with family and friends.